And on the schedule for this weekend's long run: 20-miler. Now, this is a small town and one that I strugled to find 10 miles to run in last year. 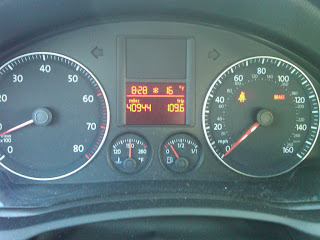 How the heck was I going to make 20 miles?! Answer: laps. Yes, 3 miles over to the other side of town...3 laps around the 2.5-mile Wagner's Lake loop, a couple out-and-back laps on that rails-to-trails thing on the Platte River levee that I think I am not supposed to be on but that I didn't notice the sign for until I was coming off of it, 3 miles back to the inlaws' donut-shaped lake, and 2 laps around the 1.5-mile loop there. Whew! I did it! And it was the most completely, gloriously, hideously FLAT 20 miles I have ever seen. Who knew flat could get old?! I was actually longing for my Colorado hills at a couple point, just do I could shake up my legs (and get a little downhill action). Luckily, the wind provided all the exciting challenge that I normally get from hills. What, 40-mile per hour winds don't excite you? Yeah, me neither; welcome back to Nebraska. And in an unrelated-yet-related note, they finally posted the race results from the Downtown Runaround 5 mile race I did here back in July. I pretty much knew my time, but had no idea how I did overall, as they didn't use timing chips and weren't quite as hi-tech as I am used to with the CO races. Well, turns out I finished 8 in my age group, which I think is my best finish to-date (hubs also finished 8 in his AG; we're Identical Age Group Twins, yay!). It wasn't a very big race, but was definitely skewed to younger, speedier runners, so I am happy with that finish (the top 100 finishers out of only 254 runners were all under 8:00 pace). One of these days I'll get an AG award...though I may have to stage my own race to get it. Ah...daylight savings, St. Patty's Day, spring...and a return to racing season for me. I really thought I would have done some of the early races this year, but it just didn't happen with the marathon training and busy life. 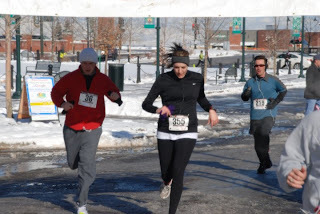 BUT this weekend, I will officially return to racing with the HRCA St. Patrick's Day 5K. Yep, that one, with the Gay Leprechaun t-shirt. 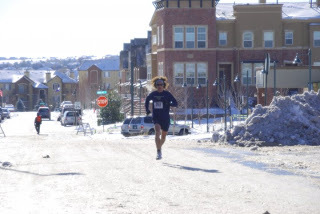 After my last year of running longer distances and consistently running the biggest hills in Highlands Ranch, this race is going to look a lot different for me than it did last year. 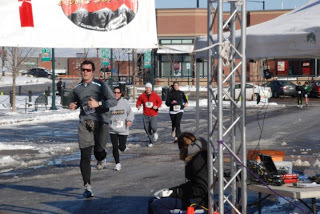 My memories of this race were a bit hazy, but I remember thinking that the hill toward the end was pretty nasty. Well, tonight I met up with a few other running buddies to run the race course, so that we'd all be familiar with it Saturday. (After being 65 for the last few days, it is predicted to snow 5-10 inches tonight/tomorrow, so there is no telling what that course will be like Saturday morning.) I've had a head cold for the past couple days, but popped some Dayquil this afternoon and was ready to run at 6:30. We had one novice runner with us, and all just took it easy and had a nice chatty, social run. I've gotta say, my perspective has completely changed in the last year; that hill was nothing. Like, seriously nothing. It is probably one of the easier race courses in the HRCA races. 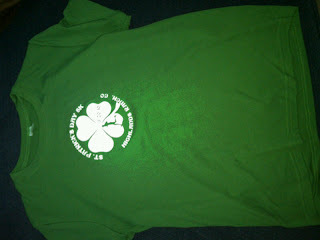 Weather permitting, I might have a speedy race Saturday...and the fugly Gay Leprechaun t-shirt to show for it. Tonight was my first official track workout since, like September (pre-break). HRRC met at the outdoor track. Some new faces, plenty of the old gang. Minor problem: it was 30 degrees. It was dark. 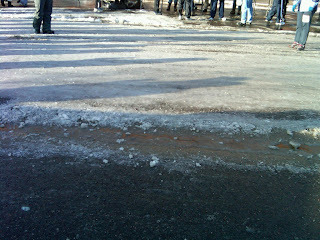 It was snowing. We ran anyway. Despite it being dark, cold, snowing, and very windy by the end, this was actually a pretty good workout for me. I kept it even on the pace for the entire workout and actually did my last 800 faster. Felt good and strong the whole time and was glad I went, despite the weather. It's running in this kind of weather that make you stronger. And appreciative of the daylight. And sun. And temps above 40. 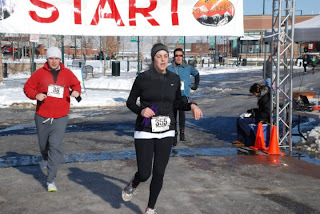 Well, bloggy friends, this weekend I became a Runner. 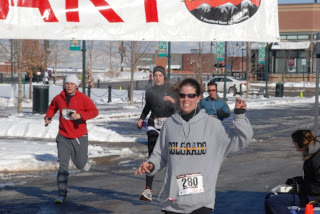 Yes, yes, it's true that I've been running for the better part of 15 years...and it's true that I've considered myself a runner for most of that time. However, yesterday I achieved new heights (or lows, as it were) in my Running life. 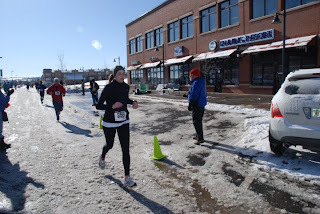 I became part of that subculture that is known as Runners (with a capital R). There are lots of things that are telltale signs of the species: black toenails; the farmer's blow; enjoying (fiction and non) books & movies about running; giving up treasured foods or drinks in order to improve the running game; ability to recall PRs at every distance; achieving the Holy Grail of Running--the BQ. 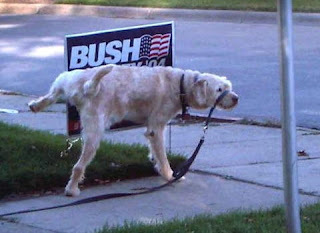 Yes, like the dog in the picture above, I peed on a bush while out for a run1. Well, yesterday I had to pee like mad (which coincidentally, I HAVE written about before) but had a known bathroom pitstop on my route. I jogged on over there, only to find a sign that said, "RESTROOMS CLOSED FOR THE SEASON." What? It's 50 degrees outside! And this is not really a classy facility, worthy of seasonal closure. This was not peep I could hold for 17 miles--I was at mile 2--so I did what any self-respecting Runner does. I looked for watchful eyes, passing cars or other runners on the trail, found a suitable large pinetree, whipped my running tights down, copped a quick squat, and then took off back on the trail at about an 7:00 minute mile in order to skedaddle right out of there.